Good morning! And Happpppy New Year. Breakfast today consisted of meatballs, mini pastrami sandwiches and some grapes. Oh, and a Diet Coke. It’s a little past noon on New Year’s Day and the dishwasher is on the third load of glasses. Mrs. E. and I finally got to bed around 3:30 am. On the whole, the party went very well. I say “on the whole” because, as usual, I actually missed talking with some of my guests. And that has to change. If you’re like me, you get stuck at one job, or in one room. I wind up playing bartender and checking on the hot food. So here’s the Easy and Elegant Life tip for next New Year’s: next year, do “door duty” for the first two hours and then, pass the hors d’oeuvres. You’ll meet and greet everyone. Off to rest up for the “Hoppin’ John” party this evening. This entry was posted in Entertaining and tagged Hoppin' John, New Year's Day. Bookmark the permalink. Happy New Year! We actually stopped hosting the big summer and winter parties we used to have, because it seemed like we never said more than “Hi” and were on to the next guest. Decided four + the 2 of us seems about right. No one gets left out and we actually get to talk, catch up etc. Now we just have to schedule a few of these more intimate events before the year starts to get away again! Happy New Year to you! I am going to try to be better about visiting my favorite blogs this year, I really was a weak blogger (writer and reader) in the last half of 2008. This is a lovely room. Is it your dining room? Is this the furniture that is usually in here? Thank you all. The party was fun. ELW, that’s a thought. A series of smaller dinner parties… but I do so love a bash. TTI, all in good time! I’m trying to get back to my routine, too. 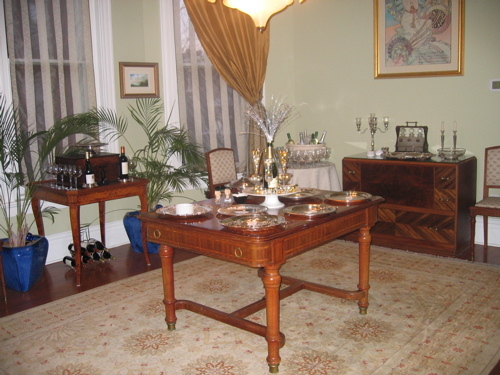 Yes, that’s the dining room and the furniture is always there, albeit in different configurations. Thanks! Hostess, Thank you. Eleven years has flown by. To avoid being trapped, working at my own party after having worked to prepare it, I have found it useful to hire my weekly housekeeper and her husband; she knows the house as well as I do and I am lucky that her husband is an excellent bartender. Their familiarity with the house and indeed, some of the guests, gives a lightness to the whole process and frees me to really act as a proper host so that I can also be a guest at my own party. Being in Los Angeles, most large parties also furnish valet parking which also facilitates things for the guests. Happy New Year to you, your family, and all your readers. Agree with bevglen: hire help if at all possible, particularly at a big bash. For our big holiday party this year (40 for cocktails) while we prepared and set up all of the food, stocked the bar, and decorated the house, we hired a bartender and also a helper to manage the glasses and keep things tidy (no passed food/everything laid out on tables) so we could concentrate on our guests. They each cost $20/hour with a 5 hour minimum, and were provided by a caterer that we use several times a year and who knows us well. Not only did the party run smoothly, but they hand-washed almost all of the glasses and dishware before leaving. In addition, we hired our handyman and his teenage son to direct traffic and tell people where to park, at a cost of $80 for three hours. With 50% “Merry Christmas” tips on top of that total came to $420 of money exceedingly well spent since it meant we were able to enjoy ourselves and spend time with our guests and not find ourselves saddled with the entire cleanup. I agree with Reggie, we had a Summer Solstice Soiree and hired a bartender and had a caterer make finger food, and I prepared platters of other items – the one thing to watch is to make sure you EAT prior to everyone arriving. As the evening went on, I felt No pain (Bartender made me a nice drink, Gulp, Swig and suddenly) I realized the action of my ways – so now, note to self, “EAT” before guests arrive, because as the hostess, I was a whirling dirvish at my own party! So even with help, there are always things to learn to do better. Your room looks like a lovely spot for a party!